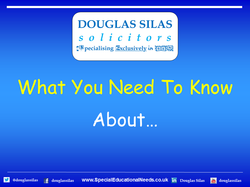 "WHAT ARE NON-VERBAL LEARNING DIFFICULTIES (NLD)?" Non-verbal Learning Difficulties are a neurological syndrome that impairs a person’s natural ability to learn how to communicate with others non-verbally and also cope with their surroundings and responsibilities. Coping with NLD is quite challenging as only a tiny fraction of how we communicate is through what we actually say. At a young age, children with NLD often have excellent memory skills, the ability to talk and read, a wide vocabulary and have a great attention to detail. Therefore the issue of them having SEN often does not come into question. This means that NLDs are often undiagnosed until much later. This is also not helped by the fact that NLDs are not universally recognised which can lead to a misdiagnosis. Motor Skills - People with NLD often have poor co-ordination and graphomotor skills (i.e. writing and cursive) including possibly displaying problems with balance. Visual, Spatial and Organisational - People with NLD often have great attention to detail, but they fail to grasp the big picture. They can struggle to adapt to changes in their environment and/or cannot organise themselves. Social Skills - It can be difficult for people with NLD to make and retain friends as they often shy away from changes to their environment and routine. A lack of common sense means that they may also develop low self-esteem, or become depressed and withdrawn. In severe cases, this depression may lead to agoraphobia (a fear of open spaces). Sensory - People with NLD can have heightened senses of touch, taste, hearing, smell and vision. "HOW IMPORTANT IS EARLY INTERVENTION?" Early Intervention is considered essential; without it the NLD can get worse. Whilst a child can struggle to cope with increasing responsibility and the need for organisation, their frustrations and negativity are sometimes misread as being lazy and unsociable. This may isolate the child even further. These later events can be prevented by an early diagnosis. Ensuring that the correct support is provided which can help the social and academic development of the child. "WHAT CAN BE DONE TO HELP CHILDREN WITH NLD?" Familiarity - Maintaining a sense of routine and organisational structure and minimising changes wherever possible. If anything does need to change, then allowing the child time to prepare and make sure that they understand what is going to happen and why, by clear explanations. Simplicity - Always speaking clearly and avoiding any jargon, slang or double meaning. Working with their School - Communicating with them about any homework set, including stating clearly what needs to be done and when it has to be handed in. At home, helping the child by working with them to plan and organise how they are going to complete the work before the deadline and get it to the school. Using technology - For some children, use of a computer can be immensely helpful. Being aware of the child with NLD's world - Thinking about the world, as perceived by a child with NLD (e.g. if they have heightened sense of hearing being conscious if there is loud music playing).